Silicon nanowires are streamlined, parallel nanostructures that resemble wires. Nanowire diameter varies from 50 to 200 nm, and the distance between structures is from 100 to 500 nm. Nanowire length, depending on etching time, can be from 100 nm up to tens of microns. Silicon nanowires have applications in micro- and optoelectronics, photonics, PV, and sensorics, and biomedicine—silicon nanostructures are biodegradable materials, which means that they break down inside an organism after a period of time. Additionally, in limited concentrations, nanostructures are nontoxic. However, hydrofluoric acid (HF), which is used in a conventional method to produce silicon nanowires, is extremely toxic. Now, silicon nanowires can be made via the chemical etching of a silicon wafer, in a process by which metal nanoparticles (for instance, silver nanoparticles) activate etching. Kirill Gonchar, a junior researcher at the Lomonosov Moscow State University, describes the process: "We've used a two-step method of etching. At the first stage, silver nanoparticles were deposited on the surface of a silicon wafer. This deposition didn't produce a level layer, but rather different island regions. At the second stage, the silicon wafer was etched in the places covered with silver. Because of this, the exposed silicon turned into nanowires as silver nanoparticles fell into the silicone sheet. And the longer the etching process, the longer the nanowires at the output. At the end, the silver was removed with the help of nitric acid." Researchers from the Lomonosov Moscow State University have replaced dangerous and toxic hydrofluoric acid with ammonium fluoride at all stages of chemical etching. Moreover, they have studied optical properties of silicon nanowires produced via this method and compared them with nanowires produced conventionally with hydrofluoric acid. Kirill Gonchar explains how the idea to use ammonium fluoride in nanowires synthesis emerged: "The idea of ammonium fluoride application wasn't new, it was borrowed from experimental methods of obtaining porous silicon that took place 20 years ago. Ammonium fluoride was also used then, instead of hydrofluoric acid. There were similar projects where nanowires were produced in ammonium fluoride, but there was no replacement at all etching stages. We've studied optical properties of the nanowires we got and proved that they don't differ much from nanowires obtained by the conventional method." Silicon nanowires, produced by metal-assisted etching, could be used for the creation of new photonic devices and silicon-based sensors. Kirill Gonchar says that nanowires are promising as sensory elements of optical sensors for different substances. This happens due to the increase of the Raman effect signal intensity, which is a "finger print" of a substance; it is also due to sensitivity to the presence of different gases, for instance, oxygen. 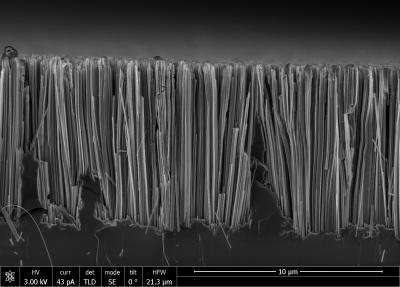 Moreover, structures containing silicon nanowires could be used in antireflection coatings for solar cells. While ordinary silicon reflects about 30 percent of light in the visible range, silicon nanowires reflect about 2 percent.